Everyone knows that to be an elite coach for pretty much any college program you need to be good at two things: recruiting and dealing with/covering up crimes. I’m not saying all athletes are criminals, but I am saying that in order to be a good criminal you have to be at least a little athletic. Coaches these days don’t really need to be great with player development or game management anymore. As long as they can recruit 5 star athletes, and keep the players out of trouble, they can usually overcome strategical mistakes. Student athletes live stressful lives. They wake up early to work out. Then they attend, do homework for, take exams for, and need to pass (allegedly) all the same classes that a normal student takes, and squeeze everything that goes into that in a tight schedule around practice and games. Add to that the pressure that comes with being expected to perform well while subject to media scrutiny. Any misstep, whether on or off the field, could lead to a bad reputation and a new career path. When an athlete does have a little free time and wants to decompress, they’re no different from any other student: he or she may partake in some underage (or of age) drinking, and/or perhaps a little reefer toking. If a player is caught, and he or she plays for a team that you don’t like, it’s your duty to shred them on social media, even though you’ve probably done the same thing. So, athletes need to find a safe place to conduct these activities. Usually a house party does the trick, but as you know, house parties are sporadic. Some start early and then fizzle out, while some become bigger and merge with others. You hear of more parties popping up throughout the night, maybe if you’re over 21 you head to a bar. As long as you’re at one of these establishments, you’re in a safe place, but if you’re caught between them, you may not be. In March of 2009, a company named Uber from San Francisco created a mobile safe place to transport athletes, and others, between safe places. For 9 years, you had to be an absolute idiot to get a DUI. All you had to do was plug in a current location, a destination, and a stranger would be there to pick you up and get you there safely for a relatively cheap price. This is the business model that made the company as popular and profitable as they are today. 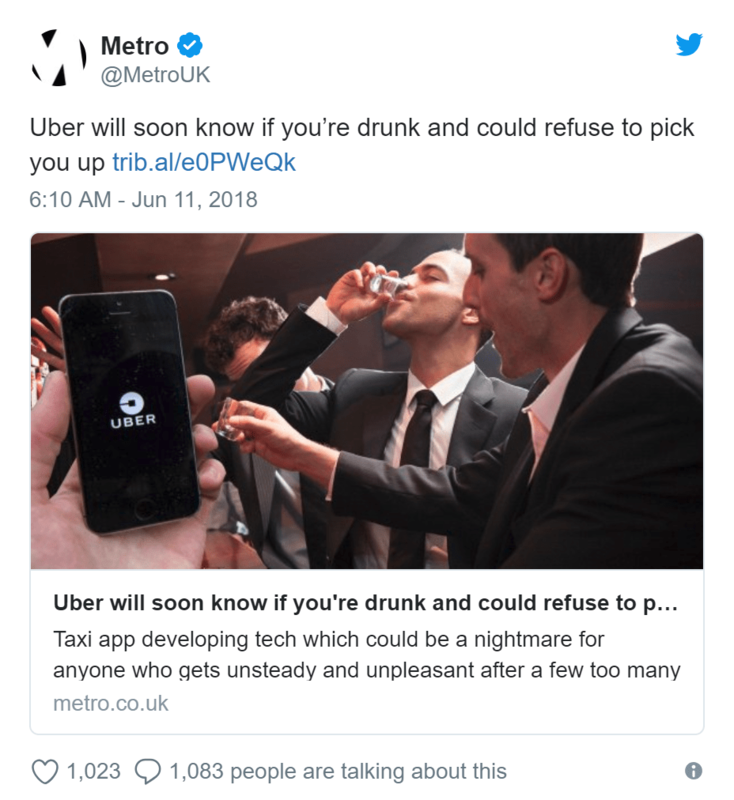 Recently, acting with a complete lack of self-awareness, it was announced that Uber was patenting technology that could determine when a customer was drunk, and whether or not to deny him or her service. Aside from the drop in profits for Uber, there may be some backlash for college coaches as well. I absolutely, in no way, condone drunk driving, but it’s ridiculous to ignore the fact that this will lead to an increase in drunk driving incidents. Athletes are not immune to this increase. In fact, with college athletes generally being more confident than regular nerds, I’d bet that a study would conclude athletes are more likely to get behind the wheel while drunk. When they’re caught, coaches will continue to do their best to get the player out of trouble, back on the field, and out of the eyes of the media. If they don’t, they’ll inevitably need to play games without some of their star athletes, end up losing, make it harder to recruit, and eventually get fired. If a coach is caught covering up what the athletes are getting caught doing, he or she will also likely get fired. It’s a lose-lose for college coaches these days. Saban better hope this technology is a few years away from being commercially used.